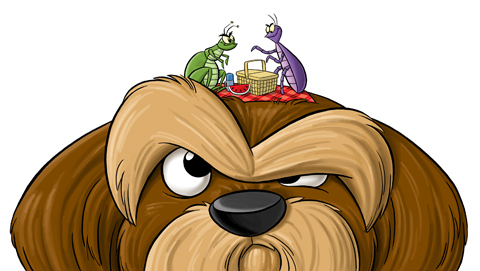 Flea and tick season is officially upon us and reports claim that due to the mild winter and subsequent rain fall over the past month, this is going to be the worst year yet. That’s bad news for pet owners and anyone who generally loves the outdoors. Yes, I am the proud owner of a beautiful pure breed white schnauzer named Max and an adorable cat named Mitzi, who has a pink nose to match the pink pads on her feet. And yes, I do love the great outdoors. Yet, none of the above statements are the contributing factors to why I am dreading an active tick season this year. My sons are going to absolutely kill me for divulging what I’m about to say, but what the hell, this is my blog, right? Okay, I get it. Who doesn’t hate ticks? Let me tell you just how far my son’s collective fear of ticks has gone. One summer night, Marc spotted a tick in his bedroom and let out a blood curdling scream. I rose from a deep sleep fearing for the worst. I almost ran head on into Rocky and Kevin outside of Marc’s bedroom door. As, I pushed his door open, I saw Marc standing on the bed in nothing but his underwear. “Are you okay? Is everything alright?” I asked. Kevin and Rocky went straight into panic mode as the chaos began to heighten. “EVERYONE CALM DOWN!” I yelled, so I could have a minute to think. We all began to search for the tiny insect that was standing between us and a good nights sleep. I glanced at the clock. 12:17 a.m. I have to work in the morning, I thought. I continued to look around the room for the tick, longing for my pillow and buying time for a way out of what seemed to be the beginning of a ludicrous all nighter. Glancing at the clock again, (12:47 a.m.) I blurted out the first thing that came into my mind. My boys were a flurry of commotion….blankets, pillows and slamming bedroom doors. I went straight to the cabinet under the sink and grabbed a bottle of Febreze, (1:29 a.m.). Surprisingly, after much talk about the dreaded ticks (3:00 a.m.), all three of my boys were fast asleep and I somehow managed to fall asleep myself. Freezing and uncomfortable, I awoke to the strong smell of Febreze and the living room patio doors covered in condensation. I got up and walked to the thermostat…the air conditioning was set to 40 degrees. “Why is the air conditioning set for 40 degrees? I inquired, as I turned it off completely. “I was trying to kill the tick.” Kevin replied. The clock read 4:00 a.m. yet I was awake for the day. I was still shivering and achy from the few hours of sleep that I managed to get on the living room floor. I felt nauseous from the strong smell of Febreze in the air as I prepared my morning coffee. And I better stock up on the Febreze. In the spirit of the season: Brad Paisley, I’d Like To Check You For Ticks. Enjoy! Now Oooohooo, you never know where one might be…. OMG I am laughing hysterically!! Good old Febreeze 🙂 it’s the new Windex (Greek Wedding)! That’s just a riot!!! Glad I made you laugh! My life…I swear! YOU NEED “Bayer Seresto Flea and Tick Collar, Large Dog” because by god they WORK. Last year was the first year in the lives of my dogs that I didn’t have to pick off a single tick from May through December. Expensive? YES. But they work. Really, they work. Thank you for the tip. I will check into it. Oh yeah! I could handle Brad Paisley’s check up for ticks. He sure is hot! !